The best documentary films reflectively illuminate the complexities of a person, a place, a situation, precisely in ways that news stories don’t. Can a news outlet commission truly great documentary work that transcends the daily news cycle? Broadcasters and print publishers as diverse as Al Jazeera, the New York Times and The Guardian seem to think so; all three have been showcasing, and in some cases commissioning, documentaries for some time. While Al Jazeera has always been primarily a broadcaster, the New York Times and Guardian now also focus on the internet as a platform for disseminating their screen works. A selection of films showcased at this year’s Australian International Documentary Conference, curated by Guardian Documentaries head Charlie Phillips, illustrate the potential—and pitfalls—of this new form. Charlie Phillips’ appointment as Head of Guardian Documentaries in October 2014 signalled an intention to commission work that went beyond news coverage. Formerly the deputy director of the esteemed Sheffield Doc/Fest, Phillips was also an editor for the pioneering FourDocs, an online initiative launched by the UK’s Channel 4 in 2005. From early 2015 to mid-2016, Guardian Documentaries broadcast 43 films, mostly 10 minutes or less in length. The best of these are outstanding works in miniature—pithy, entertaining and compact. Ruth Sewell’s From the Bronx to Yale, for example, is a beautifully engaging 13-minute film about a group of kids from New York’s poorest borough, who practice a form of competitive acting. A film about underprivileged youth that never talks about victims, it clearly illustrates the potential for Guardian Documentaries to delve into subjects and perspectives daily news journalism rarely touches. In contrast, Erol Mintas’ From Space, Syria is Here illustrates the drawbacks of such a condensed form. The subject is attention-grabbing: Muhammed Faris, the first Syrian in space, is now a refugee in Turkey. The film opens with his warm exchange from an orbiting spaceship with Syria’s then-president Hafiz al-Assad via a video link in 1987. Exiled to Turkey in 2012 for his opposition to the regime of Assad’s son, Bashar, we are told Faris is now a supporter of the Free Syrian Army. Faris’ story immediately provokes a barrage of questions. How did a Syrian get into space? How and why did a former air force general end up as a refugee? Did his political views change, or was he always secretly opposed to the Assad regime? Faris went into orbit under the auspices of the Soviet Interkosmos program, designed to help astronauts from pro-Soviet countries, as well as non-aligned states, get into space. Astronauts from countries as diverse as India, Mongolia and (surprisingly) France took space flights as part of the program, which paved the way for the International Space Station in the post-Soviet era. Unfortunately, we learn nothing of this from Mintas’ seven-minute film, nor are any of the other questions posed by Faris’ life answered. His call to Assad from space is simply dismissed by the former general as propaganda, while the film reveals nothing of his current political views beyond his opposition to the present regime. Guardian Documentaries were paused mid-2016 and relaunched in September that year. The pace has slowed, new releases are now posted monthly and the newer films average closer to 30 minutes in length. There has also been a concurrent increased deepening of content. “Our audience want more immersive, longer stories that clearly differentiate themselves as documentaries rather than news reports,” explains Phillips. The half-hour Desert Fire, directed by Sebastien Rabas and Jack Losh, is a good example of the lengthier, more complex works on the site. 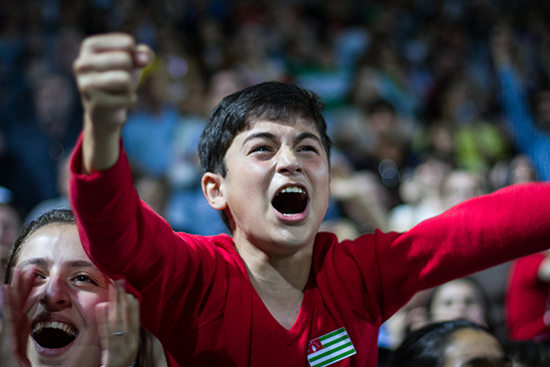 It follows the journey of the Kurdistan soccer team to the “alternative world cup” in Abkhazia, a breakaway region of Georgia, in 2016. The competition comprises stateless groups and unrecognised territories, including Kurds, Japan’s Korean minority and the population of Padania, an independent state proposed by separatists in northern Italy. Relying on the strong personalities comprising the Kurdistan team and climaxing in a tense quarter-final penalty shoot-out, Desert Fire never glosses over the myriad tensions and ambivalences contained in this story. At the same time, it deftly avoids getting bogged down in political or historical minutiae. 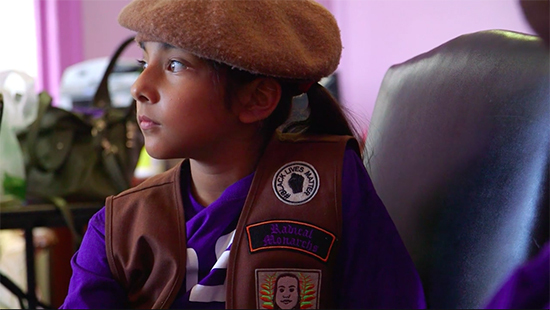 Radical Brownies, directed by Linda Goldstein Knowlton, similarly uses observation and interviews to portray the Radical Monarchs, a troupe of girls in Oakland, California who focus on principles of social justice, particularly in relation to gender and race. Oakland was home to the founding chapter of the Black Panthers in 1966, the city’s radical history providing the bedrock of the Monarchs’ beliefs and practices. It’s a stark contrast to the domestic tasks and apolitical values traditionally taught by the Brownies. The young girls interviewed in the 21-minute film are highly articulate and historically informed, as are the women leading the troupe. Their thoughtful commentary is set beside a Fox News segment, which manages to extensively discuss the Monarchs’ actions and philosophy without ever speaking to those in the group. It’s a textbook example of the way certain media outlets actively work to demonise people and ideas that question the social and economic order, masking their ideological agenda beneath a veneer of paternalistic concern. Radical Brownies is engaging, critical and incisive, setting a high bar for future Guardian films. These and other recent offerings from Guardian Documentary indicate that Charlie Phillips, true to his word, is actively seeking work that goes beyond the constraints of daily news journalism. “We want stuff that will work online and pull in an audience hungry for brilliant stories that tell them something new,” Phillips says. While the Guardian films tend to follow a fairly set formula—fast-paced observation driven by interview commentary and explanatory subtitles—the range of subject matter is impressively diverse. The majority of these works have also been commissioned rather than acquired, opening exciting possibilities for the kind of stand-alone documentaries that struggle to find slots in Australia’s current broadcast environment. Most enticingly, this online platform offers filmmakers a global audience at the click of a mouse. You can see Guardian Documentaries here. The Guardian Documentaries Showcase will screen from 8.30–10pm, 7 March, Federation Square Big Screen, Melbourne (free to the public).